Voted “Best in Show” of the 1997 Street of Dreams, this Steven D. Smith custom home exudes luxury and charm. Classic architecture combines opulence and warmth. Soaring 20- foot ceilings, travertine and granite, rich woodwork, arches and coves, Juliette balconies, fountains and porticos. A delight for the senses! Dramatic two-story entry both invites and beckons. Beautiful living room with huge views of the terraces, fountains, pool and outdoor gardens through 20-foot picture windows and French doors. Chef ’s kitchen features beautiful rich warm white cabinets, slab granite counters, huge island, stainless Viking appliances, subzero, butler’s pantry, “Tuscany” wine room with a 500-bottle capacity. Sunny informal dining area opens to outdoor living areas. Spacious Separate Dining room with its soaring barrel ceiling and open beam architecture easily sits 12. Huge main floor master suite. Conveniently tucked away in its own wing, creating a private oasis complete with intimate sitting area, beautiful marble fireplace. French doors with access to pool and terraces. Sumptuous spa-like bath with jetted soaking tub, custom curved marble walk-in shower, double vanity and walk-in closet that will fill friends with envy. Timeless library filled with paneling and shelving, floor to ceiling bookshelves with brass railings and a rolling ladder. 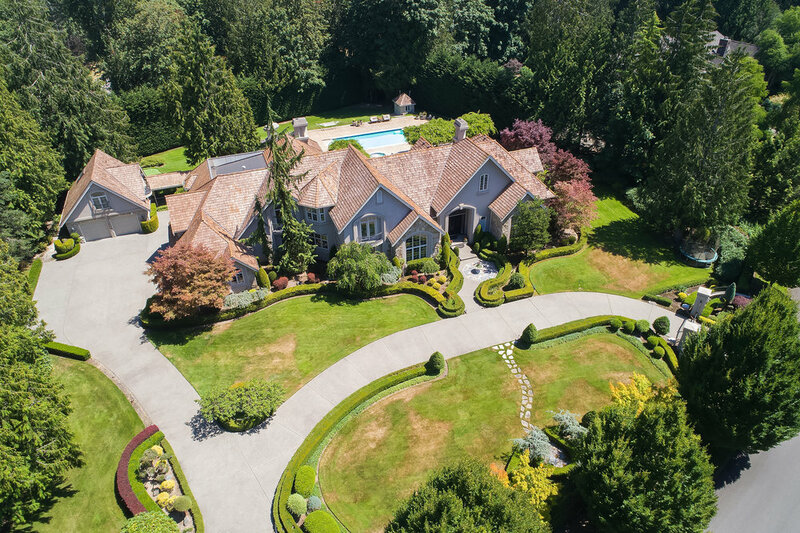 Come home to an extremely private estate in Blakely Woods adorned by a grand circular drive with two security gates, wrought iron fencing and professional manicured grounds. No expense was spared in creating outdoor living spaces with a private irrigation well serving over 200 sprinkler heads, a swimming pool and hot tub, multi-level terraces, three-hole putting green and beyond.